God will never give up on this spinning planet full of beloved people, he is and always has been doing everything possible to bring about life, joy, healing and freedom—of the body, the heart, and the mind. Yes, God’s heart is for individuals, but also for families, for neighbourhoods, for the beauty and culture of every people group on earth. He weaves together their stories, colours and delicious smells in a euphony of celebration. With eager hearts, we look forward to the reconciliation of all things, to the shalom-wholeness of everything thriving in the way it was first imagined to be: fully connected and fully alive. 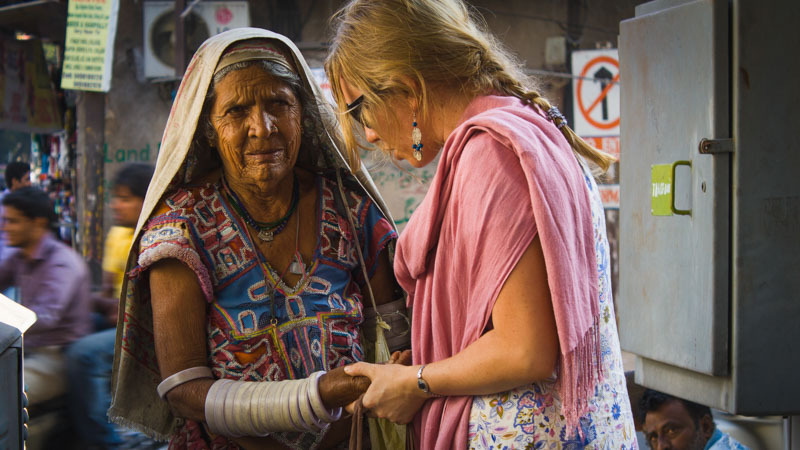 I’ve been tremendously privileged to spend about a year in India, most of my time serving among very poor women who otherwise had little access to health education or care during their pregnancies. There was much pain, loss and grief in the life of every woman I met. And yet there was joy, expectancy and celebration too. I had to retell myself the stories from Isaiah and Revelation, that God’s kingdom was indeed arriving, even now, even in the most unlikely places. I sang out those promises as well, that the Kingdom of God belongs to the very least of these, to the people who are exploited, whose voices are silenced, who live under the weight of oppression. It always has and it always will. God’s kingdom is arriving in a thousand small acts of kindness, in hope spoken into dark situations, in the prayers of the saints and sinners rising up from every corner of the globe. It is found under bridges, sitting in the dirt drinking chai, in having your saree tied just right by a new friend. It is teaching healthcare to those who have never heard the good news that God cares about our bodies and wants us to be healed. It is welcoming babies who would have otherwise arrived to a mother who laboured alone. It is recognising beauty and life where it’s otherwise been overlooked, and using media to tell stories of everyday heroes who look very different than we do. It is children being given opportunities to learn and grow and play, and governments being challenged to do justice and act in mercy. It is teaching English and seeing friendships grow across religious and cultural barriers. God’s kingdom is full of refugees finding safety, and nations learning to wage peace as they beat their swords into gardening tools. God’s kingdom is understanding that we are in this together. There is no way forward but through love, mutuality and deep respect. Even old enemies can be reconciled as the walls that would divide us start to crumble brick by brick. We follow Jesus together, we go with him vulnerably and fully alive in these present moments, no shame about the past, no fear about the future. We are His. He is ours. His presence is the richest treasure we could ever hope to find.